One more day until school starts up again! Hence I just made a batch of Ellis’ favorite muffins. He takes one to school for his snack just about every day. They’re nutrient dense with ground almonds, olive oil, eggs and flavorful thanks to both lemon and lime zest (or just one or the other if that’s all I have) and a good dollop of jam on top. 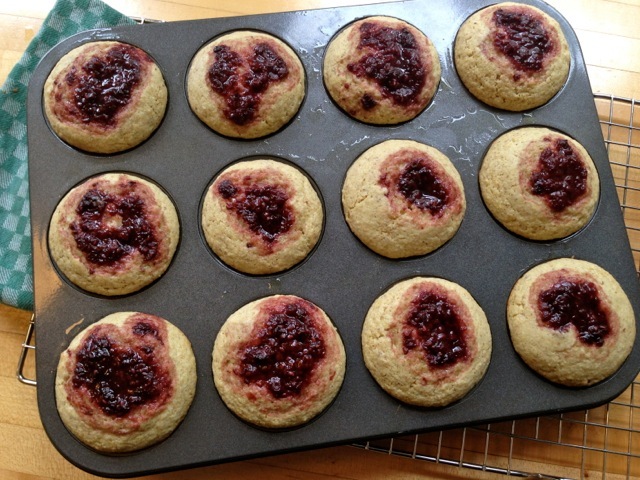 I make jam every summer in great part for these muffins. I freeze them, individually wrapped, and am pleased with myself when I pop them into his lunch bag every morning. And I will be especially so on Monday morning, having gotten quite used to reading to Ellis in bed until way past school starts these last few weeks. I’ll need all the extra time I can get to get us up and out! 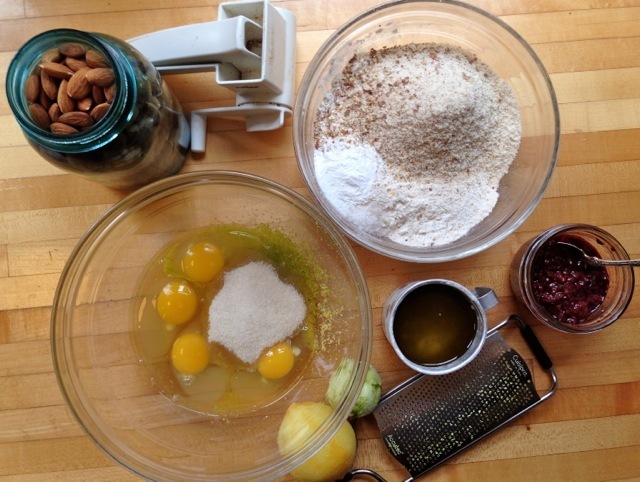 You could vary the flour(s), nuts, oil, zests, different jams or marmalades or add spices. They’re not very sweet at all so if you want a sweeter treat add a little more sugar or swirl more jam into each muffin. 1 cup ground almonds (or other filberts or walnuts). I grind nuts in a Zyliss cheese grater with the finest blade–pictured above, which makes a very fine, fluffy nut meal. Preheat the oven to 350 degrees F. Grease a 12-cup muffin tin. Blend together the flour, ground almonds, baking powder, and salt in a medium bowl. Using an electric mixer or whisk the sugar, eggs, and zests in a large bowl until pale and fluffy, about 3 minutes. Mix in the milk and oil. Add the flour and nut mixture and stir just until blended. Fill the muffin cups about ¾ full. 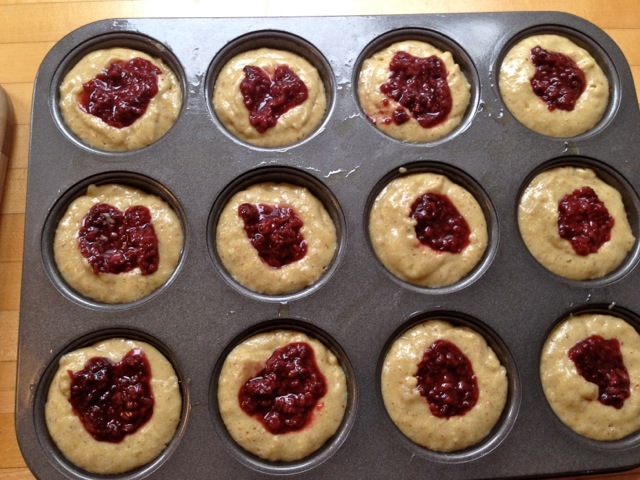 Top each one with 2 teaspoons of jam. Bake until golden, about 15 – 20 minutes. It’s a little harder to tell with these when they’re done since the jam will stay gooey. Just poke around a pit in the cake part to make sure the batter is cooked. Transfer to a wire rack and remove the muffins and let cool completely. Wrap individually in plastic wrap and freeze for easy (school) snacks. Last summer we had friends over for an outdoor afternoon meal of seafood pasta and corn muffins. I had just been making pesto and a jar of my tomato jam sat on the counter. As I prepared the corn muffin batter I decided to put a dollop of pesto in the middle of the muffins-not on top. But then I thought about the tomato jam and so did half pesto and half tomato jam. Both were quite tasty but the tomato jam was by far the favorite. I love this! So fun to discover new combinations and tricks. It does sound delicious.